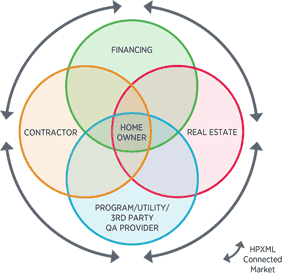 The Home Performance with ENERGY STAR Team developed the HPXML Implementation Guide to help program administrators and software developers integrate HPXML into their operations and products. HPXML is a set of common definitions, based on Building Performance Institute’s BPI-2100 and BPI-2200 data standards, for the attributes of the systems in a home and the computing language that facilitates the quick and easy transfer of home-related data between different market actors. A guide and use cases are available from the Home Performance Coalition at www.hpxmlonline.com. The following is a recording of a webinar from August 2015. Home Performance with ENERGY STAR hosted a panel on HPXML; the value it can bring to businesses and implementation methods. Interested organizations can use this resource to learn more about HPXML and its potential benefits.